Yeastar has become a Top 10 global SME IPPBX market player and it’s only the beginning. XIAMEN, CHINA / DALLAS, US – April 4, 2018 – Yeastar (www.yeastar.com), a leading manufacturer of VoIP PBX systems and VoIP Gateways, is ranked alongside Cisco, Avaya and Huawei as the Top 10 player of SME IPPBX Market (Global) for its dominant market share in 2017, according to the GLOBAL SME IPPBX MARKET STUDY conducted by Frost & Sullivan, a pioneering global growth and market consulting company. 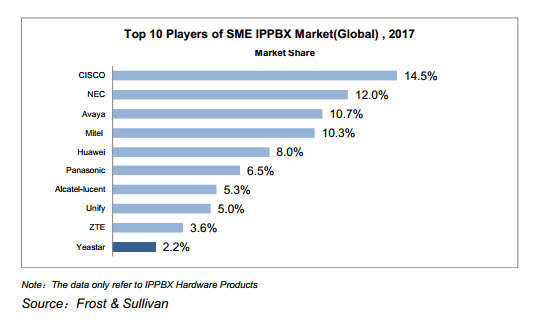 The report is based on a global analysis of worldwide hardware IPPBX manufacturers that have taken a seat in the SME IPPBX market. And it’s the first time that Yeastar has made it to Top 10 of all global players and top 3 of all Chinese companies, following Huawei and ZTE, since its establishment in 2006. Yeastar’s continuous commitment to innovation and value-added services has earned itself the best gift for its 12 years’ anniversary, and great foundation and potential for the next 12 years. With the development of small and medium businesses, according to the report, “the SME IPPBX industry would witness further growth going forward with the market size by revenue reaching approximately USD420.4 million by 2022, at a CAGR of 0.7% from 2018.” It is positive that, based on Yeastar’s extensive market coverage and sufficient customer resources, Yeastar’s competitive strength will keep growing in the future. Yeastar specializes in the design and development of innovative telecommunications equipment, including VoIP PBX systems and VoIP gateways for the SMB. Founded in 2006, Yeastar has established itself as a global leader in the telecommunications industry with a global partner network and over 100,000 customers worldwide. Yeastar products have been consistently recognized in the industry for their high performance and innovation. For more information about Yeastar or to become a Yeastar partner, please visit http://www.Yeastar.com.